BlogSelling OnlineHow to Update WooCommerce Plugin: Ecwid Has a Great Idea! Every e-commerce operation wants the latest and greatest when it comes to online presence. But updating WordPress plugins can prompt even the yoga studio owners among us to swear at the screen. The WooCommerce plugin for WordPress can be particularly difficult. Unlike SaaS shopping carts, the Woo update must be downloaded to the merchant’s computer and then uploaded to his or her store all manually and then hopefully it works with all the other plugins installed. Update the copied version of your website. If something goes wrong, use your backup to restore it. Install updates to the live site. Check compatibility with addons, themes, payment gateways, or other WooCommerce plugins. Rinse and Repeat every time there is a new update. With a new version arriving every month, website downtime could mean a loss of a big chunk of sales. And each of the plugins, themes and addons have their own update schedules and they may require different updates. Security. WooCommerce itself is not PCI-DSS certified, nor does it run on HTTPS by default, so you need to install addons and purchase an SSL certificate to make your e-commerce website secure. Plugin and theme conflicts. Even if you’re using a dedicated WooCommerce theme, it may not work well with all the extensions you’ve installed. In this case, you may have to deactivate each and every plugin to find out what caused the issue. Hosting configuration issues. Since you have to purchase hosting for WooCommerce, there’s a chance your hosting provider is not optimized for your store. If you have a large product catalog, you may have to overpay for extra storage and bandwidth to avoid risks to the stability. All needed features for ecommerce come with Ecwid, so you don’t have to install another plugin, to connect a payment option, get automatic tax rates or shipping rates. That minimizes compatibility issues to zero. Ecwid is a cloud-based shopping cart, and most data is stored in the cloud rather than your computer. So updates are light and installing them doesn’t feel like spring-cleaning. Recently, we’ve rebuilt the process of updating Ecwid with a new version. Rolling out an update to Ecwid now takes 10x times less than before! That means we release features faster and can perform more updates per day. The Ecwid team is in charge of all the store backups, updates, and technical maintenance. Our team of professional engineers takes care of Ecwid’s 1.5 million online stores 24/7. When updating the Ecwid plugin, you can rest assured that customer data is safe. Ecwid E-commerce has PCI-DSS certification Level 1, which is the golden security standard worldwide and all Ecwid store pages run on HTTPS so your customers’ data is encrypted and secure on our end. Bonus: Ecwid shopping cart integrates with any website (not just WordPress!) or social media page (Facebook, Instagram) and works seamlessly with multiple storefronts simultaneously. The integration is smooth: no messing around with downloads and code. Simply sign up and follow the instructions of the onboarding wizard. Don’t forget, too, that merchants that have questions about any Ecwid feature can contact the support team via live chat 24 hours a day on every weekday (24/5). Ecwid is dedicated to providing time-saving advantages to merchants who need every spare minute to run their businesses. But recently, we’ve added even more! We’ve made importing products from WooCommerce to Ecwid incredibly easy. With just a couple of clicks, you can copy all of your products, images and descriptions from your WooCommerce store to your Ecwid store. Now you can see for yourself what your WordPress site would look like with Ecwid. 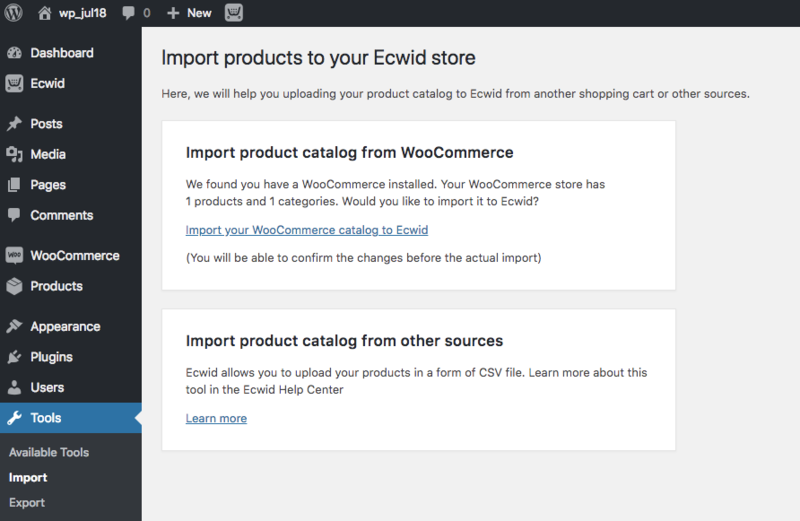 We’ve covered how to import your WooCommerce catalog to Ecwid in our Knowledge Base. Those few steps are illustrated with clear screenshots get the job done in under five minutes. So maybe it’s time to stop wondering how to update WooCommerce and work on importing WooCommerce to Ecwid? Create your free, hosted, supported and secure online store with Ecwid and get busy growing your brand instead.